The seasons are changing on our Waldorf-inspired nature table. The Carrot people are moving to the right/southern corner of the shelf, eventually they will be moved off entirely as fall, and then winter scenes sweep across from the north. 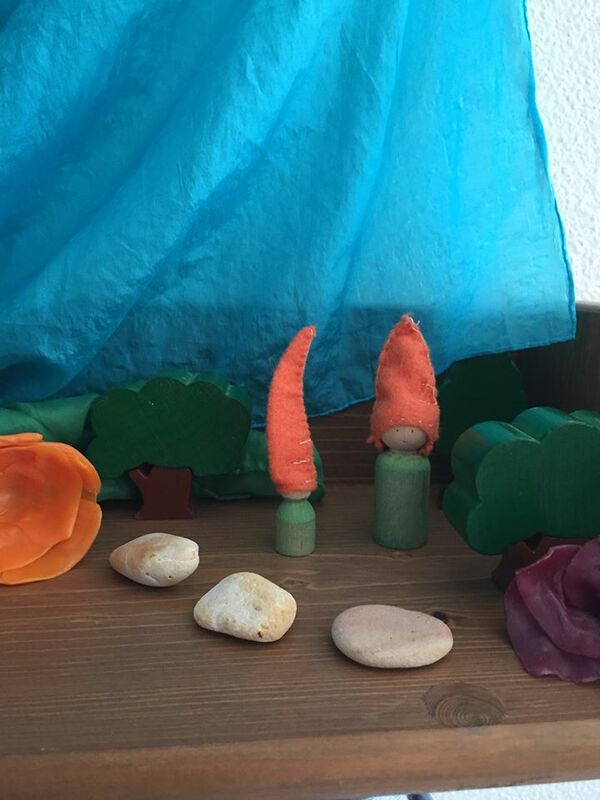 The Carrot people have been on our nature table most of the summer. Our nature table happens to be positioned north south, and in theory, our scenes move from left to right as the seasons change (when I remember to change them). Perhaps the Advent Gnomes will make an appearance again this year, followed by the arrival of King Winter (if I managed to make him in time!) although given my luck it will be just in time for the invasion of Bunnies. New to our table this late summer / early fall are St. George and the Dragon. 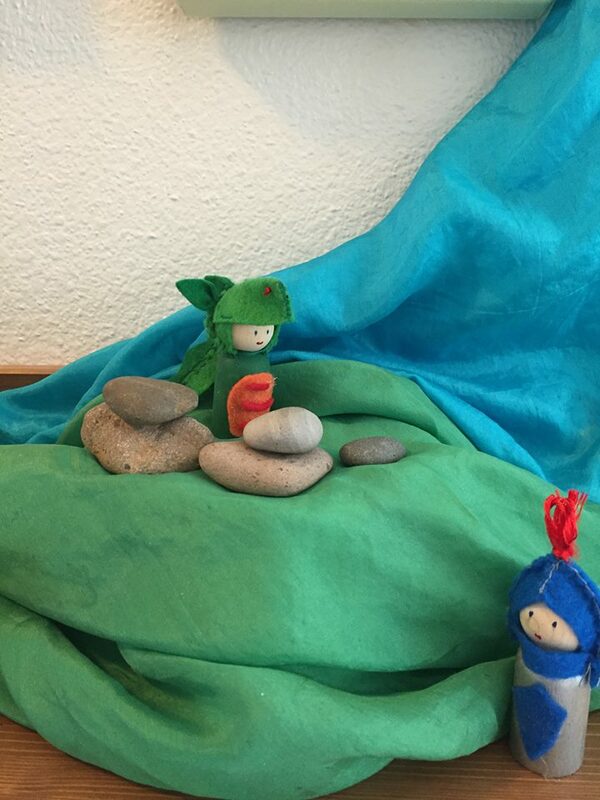 Inspired by Margaret Bloom’s figures in Making Peg Dolls , they make a lovely center vignette. The Dragon is on the top of a hill, in his lair, surrounded by boulders, as of now, St. George has not yet spotted him. Several people on facebook pointed out that St. George is missing a sword, and Oliver pointed out the Dragon is missing fiery breath. I pointed out that in the Waldorf tradition the story is an allegory, about one’s inner struggle of light overcoming darkness. It is also symbolic of the seasonal changes that are rapidly approaching — as the days grow shorter, the nights grow longer, but fear not! St. George (and the light) will triumph and after the winter solstice the light will return! Also, the children don’t need swords. 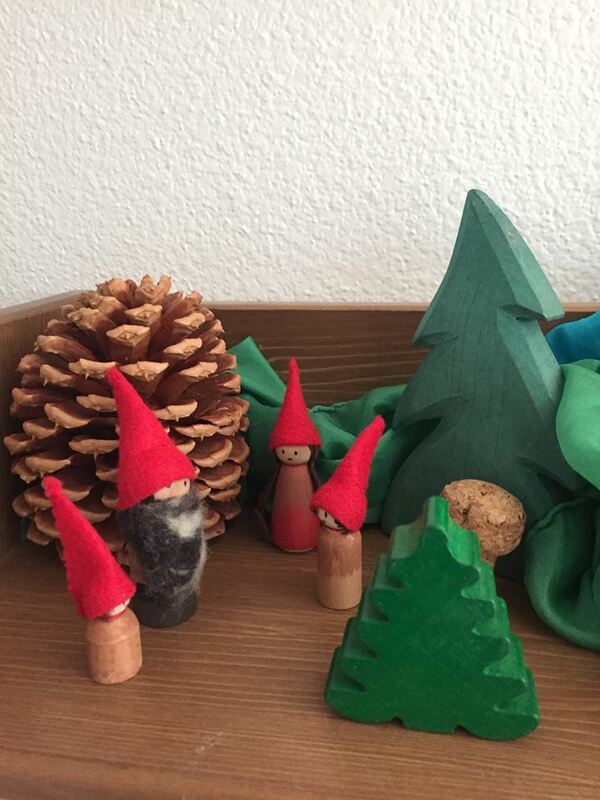 The other new addition on the nature table this fall is Gnome Family. Daddy Gnome, with a big bushy felted wool beard; Mommy Gnome, with braided pigtails (it was easiest to do her hair that way). Two little gnomes, one slightly taller than the other. They are Autumnal Gnomes, in rich earthy colors and bright red peaky gnome hats. The Autumnal Gnome Family has gathered at the northern end of the nature table, and will likely venture across it as the seasons change, eventually to move on to the bin of nature table things. I never imagined I’d have a bin of seasonal things for our nature table, or that I’d be carefully crafting little peg people for seasonal displays. There are days I walk past the nature table and wonder, who is this person and when did that become me? This is not necessarily a bad thing, but it does give me reason to stop and pause, and then the Dragon goes on walkabout, and St. George has to hunt him down and haul him back to the nature table.